Yeah, I’m sick. I left work in the middle of the day yesterday, which I never do, but staying upright was becoming a challenge. I came home, had some soup, and went to bed. But not before telling Luau at least twelve times that I felt like crap. And that my throat hurt. A lot. And that it felt like I was swallowing sandpaper. And that I really, really didn’t want to be sick. Yeah, I was just a barrel of monkeys. But despite not being able to communicate a lot about how she’s feeling, my kid is far more self-aware than her ability to describe that self-awareness might lead one to believe. So when she drags her stuff onto the floor to sleep, I start playing detective. You see, if we really believe that all behavior is communication, as I whole-heartedly do, then we spend some time as Encyclopedia Brown to find out what exactly the behavior in question is meant to communicate. And when a kid with a seizure disorder eschews her bed for the floor, well, yeah. When Katie was a baby, her ear smelled funny to me one night. I didn’t know what it was, all I knew was that it felt “wrong.” At my insistence, Luau took her into the pediatrician’s office the next day. When he got to the exam room, the nurse practitioner, a lovely middle-aged woman who had raised three kids of her own, asked why they were there. Upon his own admission, he rolled his eyes and could barely keep from laughing as he said, “My wife says her ear smells funny.” The nurse checked her out and said, “Your daughter has an ear infection. Tell your wife she’s got a good nose.” He never laughed nor rolled his eyes at my Mama gut again. So I told him that I had a weird feeling – that I felt like something was going on with Brooke. That the sleeping on the floor had started it, but that there was something else — something that I couldn’t put my finger on, but that just didn’t feel right. I told him that I’d had a vision of getting a call from the school telling us that she’d had a seizure in the middle of the day. That I saw myself running out of the office to get to her. I told him that I just needed him to know. To be extra vigilant. To make sure she wasn’t alone, even in the house, for long periods of time. He promised. That evening, when I came home from work, I posted the following. My kid was in her nightgown at 5pm. Exhausted. Something wasn’t right. And as amazingly wonderful as her response to “How are you feeling?” was, it gave me no insight into how she was actually feeling. I mean, except for love, which is awesome. But, yeah. Although my throat had been bugging me for a couple of days, it wasn’t until I hit the wall yesterday that I realized that I was actually sick. And it wasn’t until sometime later that afternoon that I began to put the pieces together fully. There I was, in bed, in the middle of the day, just like Brooke had been the day before. So perhaps she had been struggling through a low-grade version of what I’ve got (or a high-grade version and she’s just a lot more resilient than her Mama, which is highly probable.). Of course none of this explains the sleeping on the floor bit, so it’s still possible that there was indeed increased seizure activity, perhaps due to the illness, but either way, it all felt a little less sinister. Anyway, my point in all of this comes back to where I started. Yesterday afternoon, I went to bed after a good ten minutes of bitching to Luau about how I felt. And being able to do that helped. It just did. Being able to say, “Grrr, I feel like crap,” helped. Hearing, “Oh man, I’m so sorry you feel that way,” somehow made it just a little easier to feel that way. Knowing that if I need to, I can go to the doctor and tell him or her exactly what I’m feeling so that s/he can diagnose it and get me the treatment I need, helps. My girl can’t do that. Both practically and emotionally, it scares me. Thinking about how I would feel if I couldn’t tell anyone what was going on inside my body scares me. Thinking about how I would have felt at work if I had no way to explain why I needed to leave terrifies me. I don’t have a better word than claustrophobic. That’s how it makes me feel just to think about not being able to tell anyone what I’m feeling — trapped. I have no way to wrap this up and I’ve pretty much exhausted the energy that I had for the day writing what I already have. I guess I just wish that Katie’s magic wand could help us out with this one too. In the meantime, I’m going back to bed. Yes. My guy was sick and the way we knew was he wasn’t talking. I took him to the doctor and they did a strep test and yup. I’m so sorry, Sweetheart! It’s all so terrifying! Hoping and praying you and Brooke heal quickly, Jess. Wish I could bring you my chicken soup. Thanks for sharing! It so helps to know I’m not the only one on this crazy train! Follow your momma’s instincts, it’s a God giving gift! Oh, honey, we’re ALL riding the crazy train. Lol. Oh, honey, I soooo get this. I’m sorry you’re sick; I know it makes everything else feel harder, too. Please rest and get well. We have finally identified certain triggers for seizure activity in Nik; illness and high stress days are big ones. If Brooke is under the weather, everything will use up more spoons. Maybe a low key rest of the week for both of you is in order? Sending hugs and love. I get it. I really do. I let my youngest stay home on Monday for that same reason. Her behavior was telling me that something was “off.” Not drastically…no fever…but, “off.” I was watching her go in and out of the bathroom at a time of day that is not typical for her. (And she was not playing…sometimes, she can play in the sink for hours.) I listened to MY gut (instinct) about her gut (literal). As I read your description at the end of the post, it reminded me of when my children were infants. There were those times that they would cry for hours, despite all the attempts to sooth. Change the diaper, feed, burp, rock, etc. I always knew that “something” was wrong that they could not tell me. Have you ever had those horrible gas pains that feel like a knife through your gut? I have wondered how many times my babies were feeling that, and they could not tell me, and I am so glad that I just kept on holding them and comforting them and rubbing their little backs. Or the ear infections…I always “knew” those were coming, too. Or the beginnings of a virus? Little did I know that my girls were dealing with all sorts of sensory issues as well. I am so, so glad that I listened to my Mama Gut. I would turn down the lights, gently rock them, singing softly, find my inner calm, and just be with them. Eventually, my girls talked, and talked a lot. But, they still never seemed to be in touch with the causes of distress. I always felt like a detective. I STILL feel like a detective. God gave us the Mama Gut for a reason. I hope you let Luau take care of you both. Be well. God gave us the Mama Gut for a reason. So amazingly put. There is no scientific proof of “mommy intuition”, but there is a certain knowledge of your child, an instinct perhaps that is biologically nurtured, that makes us just KNOW. When my daughter was 4 months old, I picked her up from the babysitter and just KNEW something was wrong – listless, no smile, vomiting – and I knew it wasn’t a bug. Fast forward three weeks, four ER trips, a week long stay, multiple tests, 2 pounds lost on an infant, and a feeding tube and central line placed for nutrition. But still vomiting. From day one I told all hospital staff it wasn’t a bug, it wasnt the flu. They thought I was crazy. I kept going back to the first day, that she was at daycare. I begged for them to look at her head, I just felt she had been hurt. And she had. A CT of her head was done and showed bleeding on the brain. After being sent immediately to Johns Hopkins, and more tests followed by more surgeries it was determined she had been hurt at daycare. And I knew from day one (I pulled her twin brother from the daycare just based on my intuition). If I hadn’t insisted to the doctors to keep looking, keep testing, that I KNEW it wasn’t a stomach issue, I don’t know what would have happened. As a parent it is our job to advocate and push for our children. If all you have to go off of is a gut feeling, then do it. You are an amazing mom. Thank you for your blog. Jesus. I am so sorry. I hope there were no lingering effects. Good job, Mama. A) Feel better. 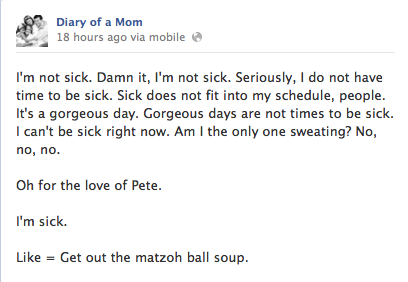 Matzo ball soup cures everything. Really. B) Between the seizures and possibly not feeling well, could Brooke’s balance be feeling off, making her feel better sleeping closer to the ground? When I was reading, I was wondering if she might be afraid of falling out of the bed. Also. Get well soon. And you make some excellent points even though you must be feeling awful. I’m amazed you still found the energy to write! But thank you for writing this. I am suspected of having (not confirmed, but I do have the marker for epilepsy) that I have very mild partial seizures. My brain feels hot (not physically hot, just feels hot), I “see”/feel white spots on my brain, get easily confused, am more tired, and I bump into stuff a lot (I had one of those events this week, and wound up breaking a pinky toe because I ran into a steel roller thingy used to hold wood planks, bruising my arm by walking into a door knob, and then have been dropping things a lot). I’m also uncoordinated as heck (not including the dyspraxia) and get the occasional deja vu episodes. The floor is cooler and more stable than a bed. I’ve actually woken up from sleep with a seizure while in bed, and have been unable to move. It’s a good thing I wasn’t warrior ninja during the night, as I could have easily suffocated. The floor is a lot safer. It’s hard when they can’t tell you. Daniel has asthma and it is so unsettling that he won’t say when his breathing is bad. He doesn’t wheeze, it just gets tight. I can not tell by a way he holds himself, it’s hard to explain. It is so upsetting. He also doesn’t like to say he doesn’t feel well because it will upset his routine if I keep him out of school. So he fakes it! He feels it is a personal failure if he is sick….and he just doesn’t want to be sick (who does?) even we pretend we aren’t getting sick when we are (like you mentioned 🙂 I have noticed sometimes he’ll ask me about myself? Look for sort of backwards questions…. My son does the same thing! Both with the asthma and backwards questions. If he asks me if my head hurts I know he must have a headache. Dang, I just FOUND your blog and you already made me feel ALL the feelings. Good gut, Mama! You just summed up my greatest frustration with autism.. something’s going on and there is no way for him to communicate it to me other than through his behavior.. Detective work does not always wrap up in 30 minutes like in TV land, sometimes it goes on for days, weeks, trying to decipher what brought on this change in behavior. Makes me wanna scream into my pillow! My son has visual pain. I don’t know if any other moms out there know about this but it exists. If he doesn’t see it, it doesn’t hurt. My son has Crohn’s and did not show any signs of it until it was too late to save his colon. He was acting kind of quiet for just a few days before he was diagnosed but nothing to the extent of his illness. His poor colon was like tissue paper but he didn’t complain. Because he could’t see it. But if he has a little cut on his finger, OMG, it’s like he cut his finger OFF. You kind of have to learn to read his actions, because medically, his blood pressure, heart rate and temp don’t give any indications that he is in pain. Like you said, Jess, it’s just something you feel inside you because you know your child so well. We have been in Seattle Children’s Hospital since July 4 and still his vitals are a mystery to the staff. It is very mysterious. I am so sorry that you are sick and I hope you feel better soon!! I hope that Brooke has not had any seizure activity. I will share with you that about two years ago Dawson starting sleeping on the floor. At first he was going back and forth between the floor and his bed. Then finally just the floor. After talking to his SLP and his OT we felt that he was meeting a sensory need. Even when we got to hotels he will sleep on the floor(yes we bring a sheet to put on the floor because of the germ/dirt thing) We finally removed the bed from his room to make room for some sensory equipment. I think he likes the feeling of the cool hardwood floor and “the sense of being pulled to the floor”(ok I am not sure if that makes sense, but when you are feeling better then try taking a little nap on the floor….ok if you are going to take a nap then the floor may not be your first choice, but you get the idea). For my little guy it is getting in a sleeping bag, pillows and blankets all around him on the hard wood floor. This is the most safe secure spot for him. It is where he “finds his calm” and sleeps. Dawson has seizures too and for us I don’t think the sleeping on the floor and the seizures are connected, but again that is just us. I think my little guy found another way to soothe himself. It really makes perfect sense for my Dawson. When he was first diagnosed he would spend a great deal of time rolling on the floor or on the floor dropping things in front of his eyes. Please know the above is not to discount your mama gut. I am all about the mama gut and it has served me very well with my kids. I just wanted to share with you our experience with sleeping on the floor. Your adventures make me very, very, tired. I just couldn’t keep up with you. I was thinking about this very thing today. And when we can’t “see” their illness or understand how they are feeling… well, it amazes me that our kids cope as well as they do. A few thoughts about sleeping on the floor: when I feel sick I go between bouts of being extra chilly to feeling overly warm and sweaty. Sleeping on the floor could be a way to cool down. Or perhaps she had a mild ear infection, a touch of vertigo and being literally on the ground was… well, grounding. 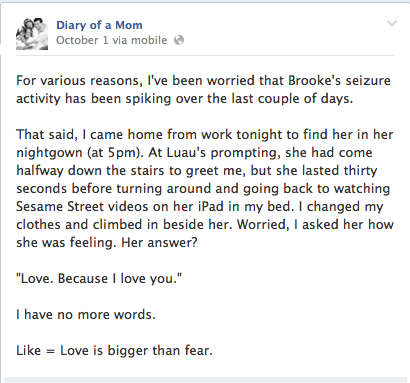 I’m curious, how does Brooke’s seizures present? My daughter who is autistic and also has epilepsy presents first with unresponsiveness, a gag, vomit, then smacking and staring off. Then she recovers from it and usually sleeps.